There will be no sleeping bags, campfires or marshmallows but a lot of fireside conversations. This now annual outing will go on tonight and all day tomorrow (April 4, 2012) The Secretary-General and senior staff of the UN Secretariat meet with Security Council members at the Greentree Estate on Long Island. There are apparently three areas of focus for the retreat: improving the on-the-ground impact of peacekeeping operations, the growing challenge that transnational crime presents to peace and security, and the approaches at the Council’s disposal when dealing with gross violations of human rights. (Please See Link Below to "Security Council Report" which has a more comprehensive and interesting article on the Retreat). They were also planning on a game of paintball for the evenings recreation, but an ambassador not to be named wanted lay paintball landmines throughout the estate. Another responded by wanting to bring along a real AK-47, just as a deterrent. Isn't that how wars are prevented or started?? 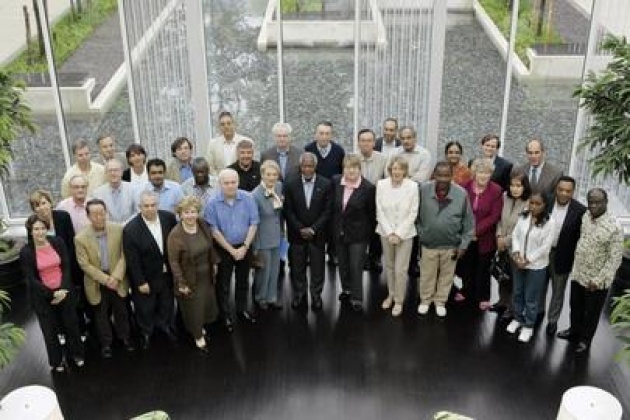 un Photo - 2006 Retreat with UN Secretary General Kofi Annan & UN Security Council Members ("Significant Others" also invited).